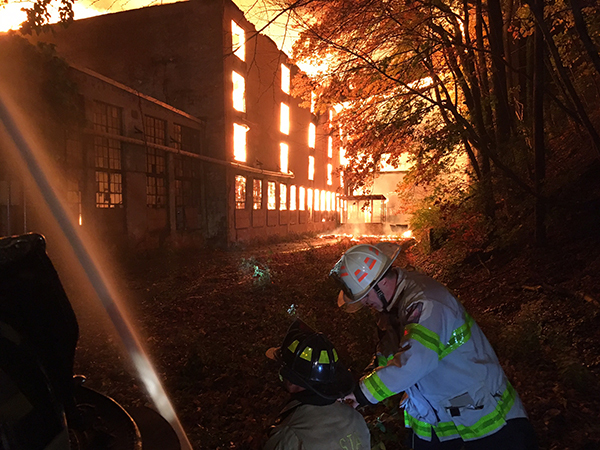 Firefighters battled a massive blaze at a vacant warehouse in Wilmington, Delaware. WILMINGTON, Del. (WPVI) -- Firefighters battled a massive, four-alarm blaze at a vacant warehouse in Wilmington, Delaware. The flames broke out near Riddle Avenue and Mill Road around 3 a.m. Wednesday in a large warehouse Action News is told was once used for leather goods and barrels. The location, though, is so secluded that fire officials had to call-in a state police helicopter to determine the precise location from where the fire was emanating. The sheer size of a complex only served to make the fight that much harder. "There were large commercial structures, six in total, five of which were fully engulfed. A lot of the heavy timbers dropped to the lower levels, areas we were unable to get to it," said Battalion Chief James Jobes. The fire grew over the course of more than two hours. Tanker trucks from nearby Odessa, Delaware and Chester County were called in for support. The Action Cam captured a dramatic moment when a large side wall collapsed during the blaze. "It was huge, there was a lot of crashing," said Nicole Gracey. "I didn't know if it was things exploding in there, because it's an old factory, you don't know what's in there." City officials say a private developer had recently purchased these old structures with the intent of converting them into modern condominiums. The fire marshal's office is investigating the blaze.